Pumpkin Yogurt Mini Cheesecakes – a delicious, easy and healthy version of pumpkin cheesecake, perfect for an afterschool snack that kids will have a great time assembling and decorating by themselves. Fall has officially arrived and to celebrate the start of the season, last week, I took my twin 3-year old girls, after their morning preschool, to a local orchard to pick some pumpkins. We had so much fun, the girls picked out five pumpkins — one for each member of our family. Later, after my 7-year old son was home from school, I wanted to have a fun fall themed afterschool snack that we could all make together, so the girls and I headed to our local Walmart for supplies. 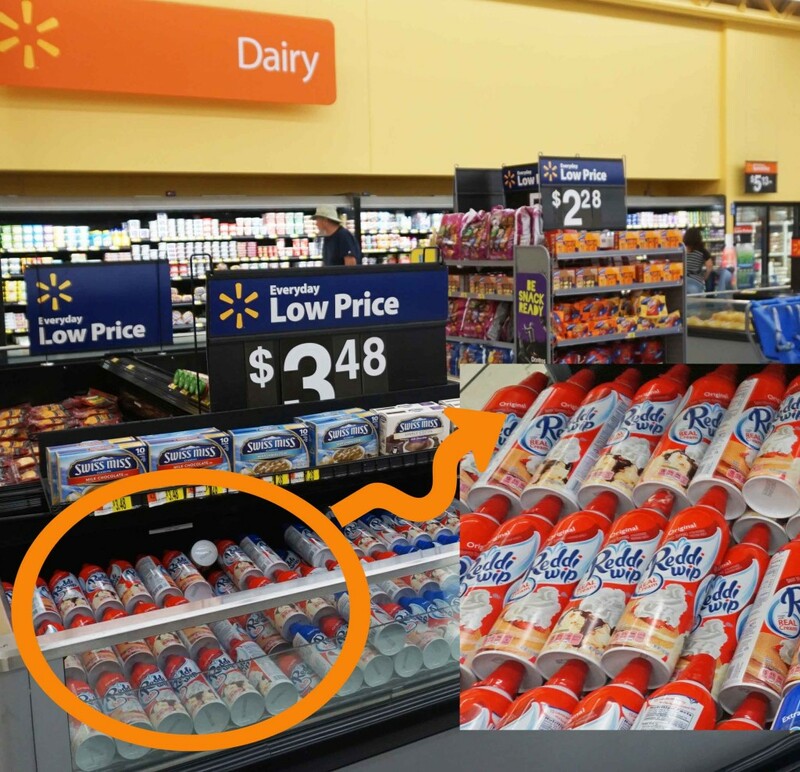 Yogurt is a favorite snack at our house, so we went to the dairy section where I spotted these Oikos® Pumpkin Pie Greek Yogurts and thought great, we can make a healthy version of pumpkin cheesecake. Also, in the dairy section, we picked up some cream cheese, to mix with the yogurt to make the cheesecake filling, and some Reddi-wip® for the cheesecake topping. We then headed over to the Pie Fillings section, to pick up pie crust for our cheesecake. 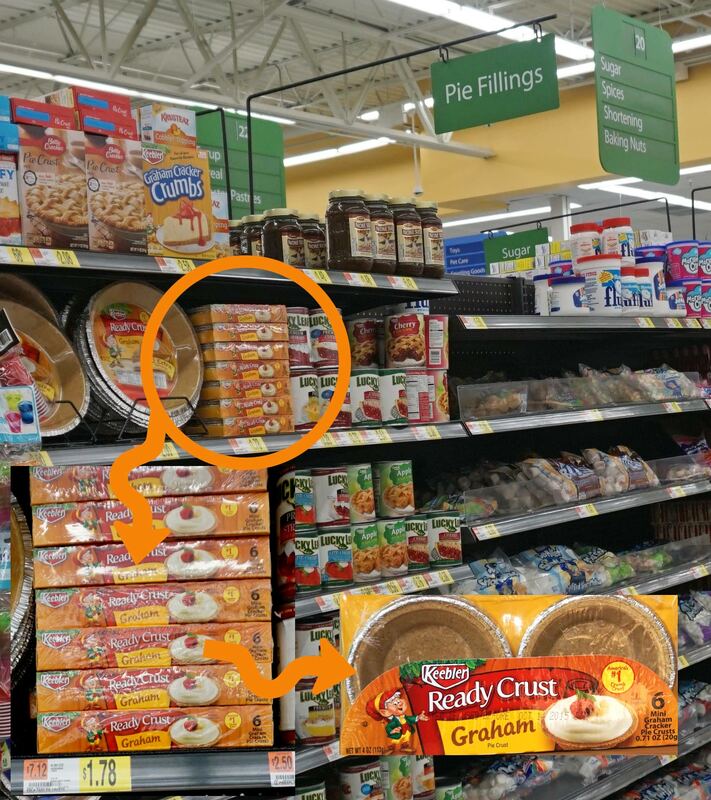 I spotted these adorable, little Keebler® Ready Crust® Mini Graham Cracker Pie Crusts and thought, perfect we can make mini cheesecakes and each of the kids can make and decorate their own cheesecake. 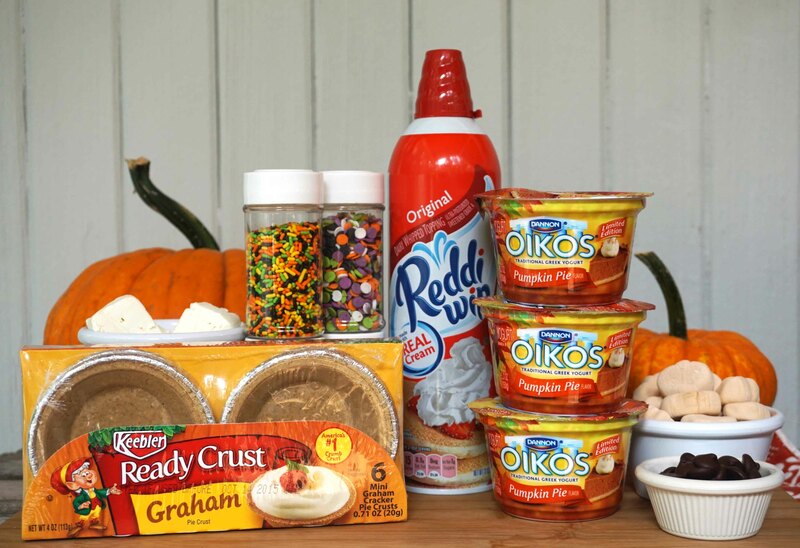 We then picked up some fun fall colored sprinkles, chocolate chips and some pumpkin shaped marshmallows, for decorating the cheesecakes, and we were good to go. When we were back at our house and my son had returned home from school, it was time to make our Pumpkin Yogurt Mini Cheesecakes. 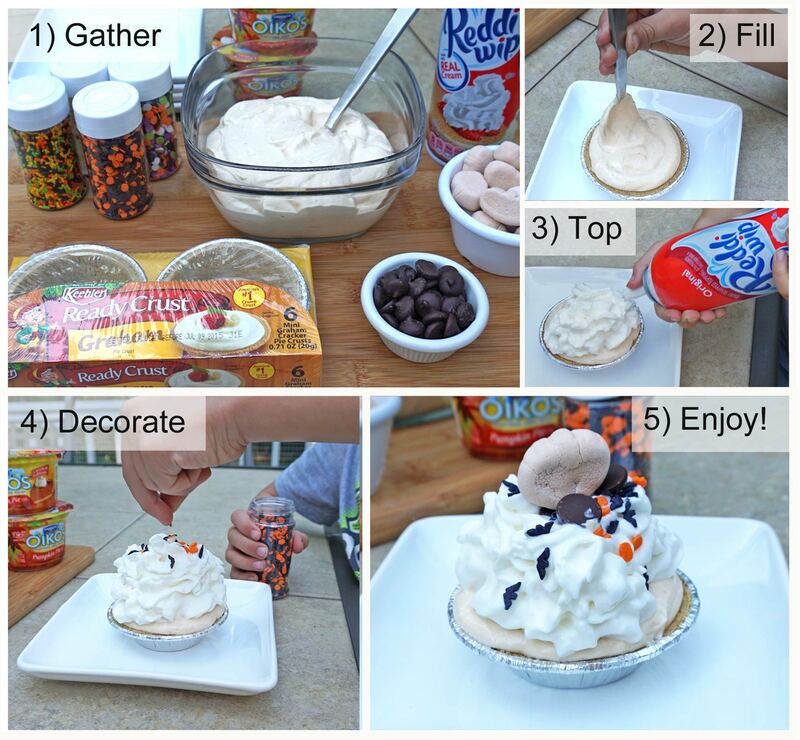 We would only need five ingredients – including the Oikos® Pumpkin Pie Greek Yogurts, Keebler® Ready Crust® Mini Graham Cracker Pie Crusts and Reddi-wip® as well as the cream cheese and various toppings for decoration. First we made the pumpkin cheesecake filling by combining the pumpkin yogurt with the cream cheese. My girls had a great time helping me do this using the standing mixer fitted with the wire whip attachment. Once our filling was ready, we headed outside to our deck, to assemble and decorate our Pumpkin Yogurt Mini Cheesecakes. The kids’ Oma and Opa had arrived by this point and they were happy to join in on the fun. 1) Gather – First, we gathered the ingredients that we would need on our outside table. 2) Fill – Then, we spooned the pumpkin cheesecake filling into the Keebler® Ready Crust® Mini Graham Cracker Pie Crusts. 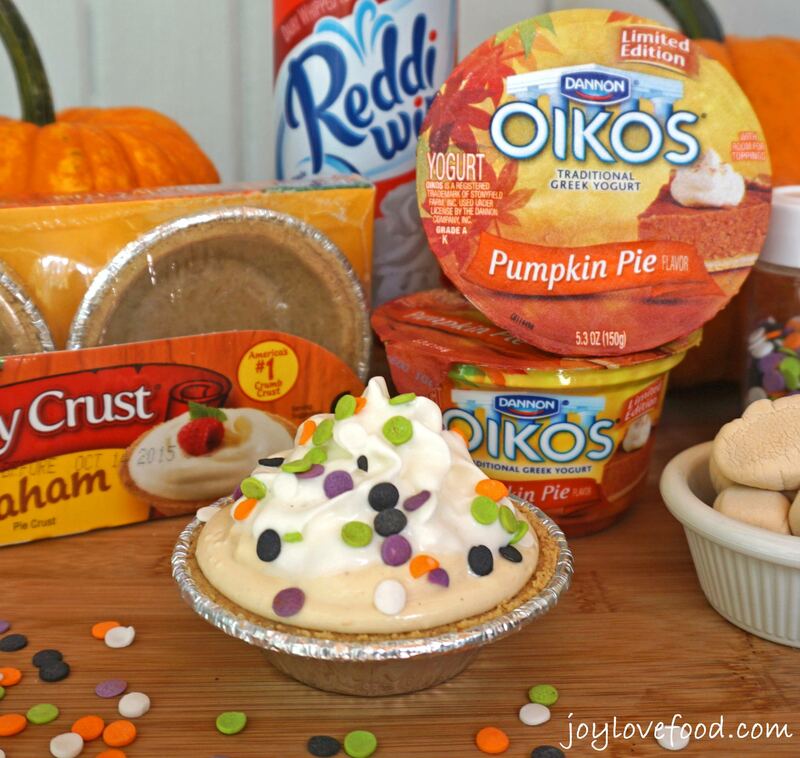 3) Top – Next, we topped the mini pumpkin cheesecakes with Reddi-wip®. 4) Decorate – Then, we decorated the mini cheesecakes with various fall colored sprinkles, chocolate chips and pumpkin shaped marshmallows. 5) Enjoy! – Finally, we all enjoyed our delicious creations. The resulting Pumpkin Yogurt Mini Cheesecakes were so delicious, perfect for a quick, effortless and fun afterschool snack. Plus, I love that they contain protein rich Greek yogurt making these little cheesecakes a wholesome snack as well. 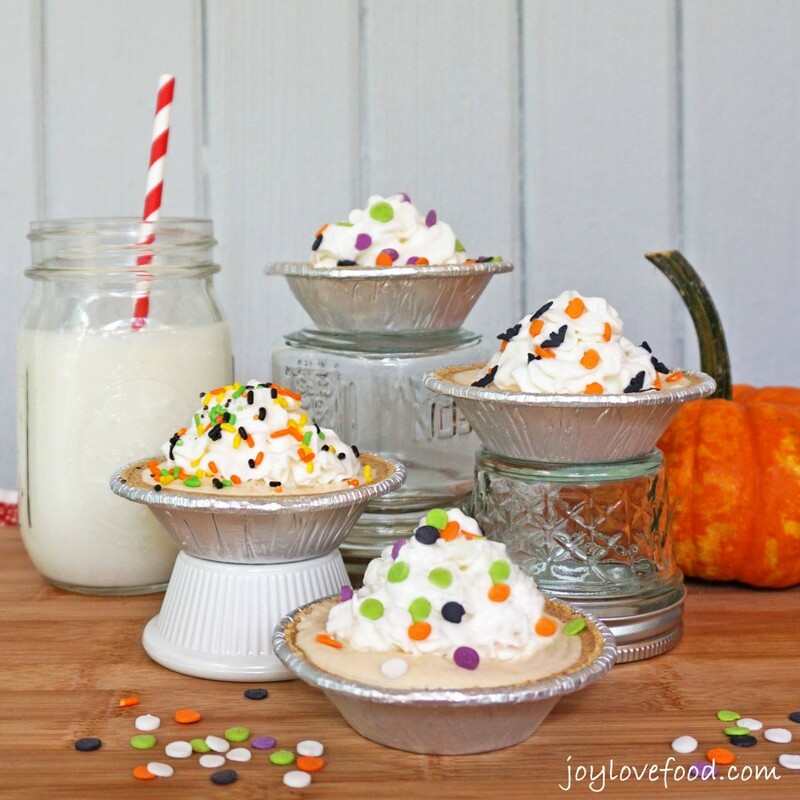 These Pumpkin Yogurt Mini Cheesecakes are a wonderful afterschool snack for the fall and the upcoming holiday season, that kids and grown-ups alike will have a lot of fun assembling and decorating. These delicious Pumpkin Yogurt Mini Cheesecakes would also be great for a healthy dessert option. These cute little cheesecakes would also be perfect for a fall party, game day or other get together. Set up a Make Your Own Pumpkin Mini Cheesecake Bar, with the yogurt cream cheese filling, the mini pie crusts, Reddi-wip®, and assorted toppings for decorations, and guests will have a great time creating their own mini pies. 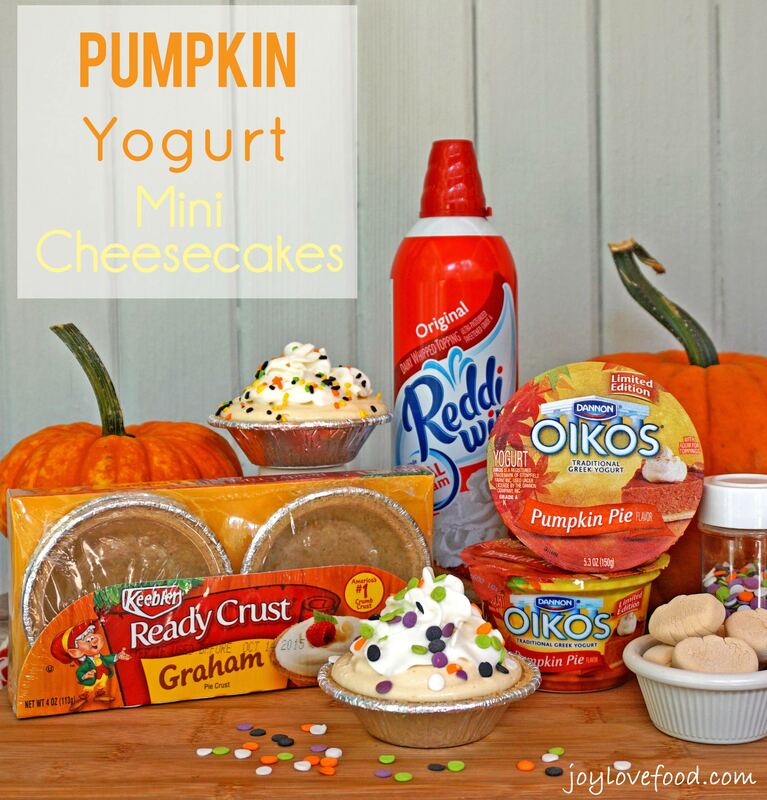 How would you top your Pumpkin Yogurt Mini Cheesecakes? Please let me know in the comments below! For more delicious fall recipe ideas, be sure to check out Oikos® and Reddi-wip® on Pinterest. Pumpkin Yogurt Mini Cheesecakes - a delicious, easy and healthy version of pumpkin cheesecake, perfect for an afterschool snack that kids will have a great time assembling and decorating by themselves. 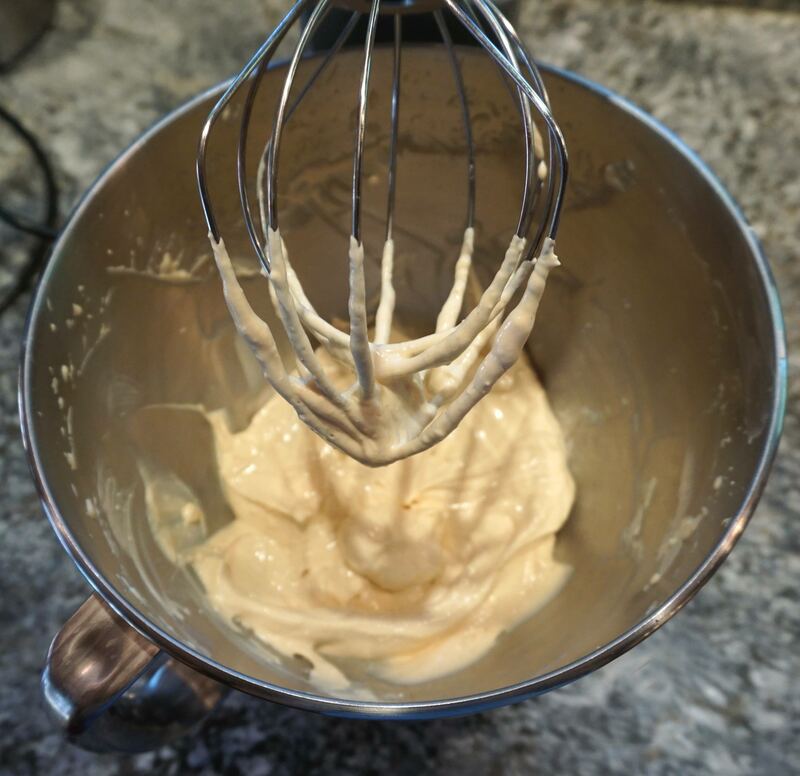 In a large bowl, using an electric mixer fitted with the wire whip attachment, beat together Oikos® Pumpkin Pie Greek Yogurt and cream cheese, until well combined, about 3 minutes. Spoon yogurt cream cheese filling evenly into six Keebler® Ready Crust® Mini Graham Cracker Pie Crusts. 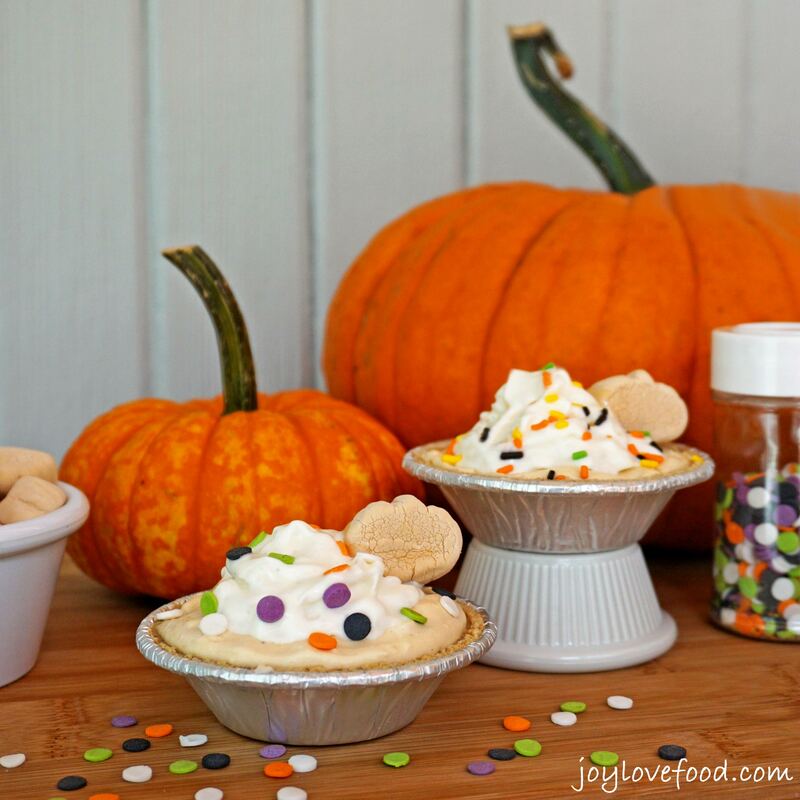 Top individual pies with Reddi-wip® and decorate with assorted fall themed sprinkles, chocolate chips and pumpkin shaped marshmallows. This entry was posted in Desserts & Sweet Treats, Healthy Snacks and tagged cheesecake, dessert, easy, effortles, fall, graham cracker crust, greek yogurt, healthy, kids, mini, party, pie, pies, pumpkin, quick, snack, yogurt. How fun. 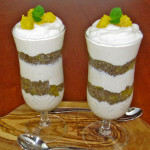 What a clever and tasty way to use the pumpkin yogurt. 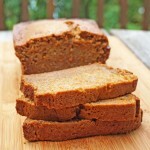 Thanks for sharing such a wonderful Fall recipe! I’ve never had Pumpkin Cheesecake, so after seeing your recipe I might have to change this! These indeed look so cute and perfect for the Halloween theme party…Yummmm! These are adorable! I think I will top mine with a caramel drizzle and maybe some mini chocolate chips! 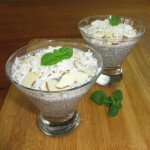 Joy, an easy, fun and yummy recipe! Who could ask for anything more? It seems perfect for this autumn season, especially if you don’t have a lot of time to prepare a dessert or special treat. Thanks for sharing it. Simple yet yummy! You are a clever lady! Cutest cheesecakes ever and there’ s pumpkin involved. I’m coming to this party ! One of my favorite Fall treats! I love the idea of these individual sized pies! OMG how cute are these! They wouldn’t last long in my house! Ooh love the sound of pumpkin cheesecake – not something I’d have ever thought of. I often mix yoghurt in my cheesecakes, apart from anything else I like the tang it gives. These are so cute. My daughter would love these. I love that this recipe is light and so easy to put together! This is such a great, clever idea! I love it! Thank you for sharing this delicious recipe! These look so cute and east to make. My kind of dessert and I’m a terrible baker. My son will love these. Oh Yum!! What a great little dessert!! Thanks for sharing on My 2 favorite Things Link Party!! Come back again!! Pinned! Elaine recently posted…Outside Fall Décor! These looks so cool!! I love the idea!! 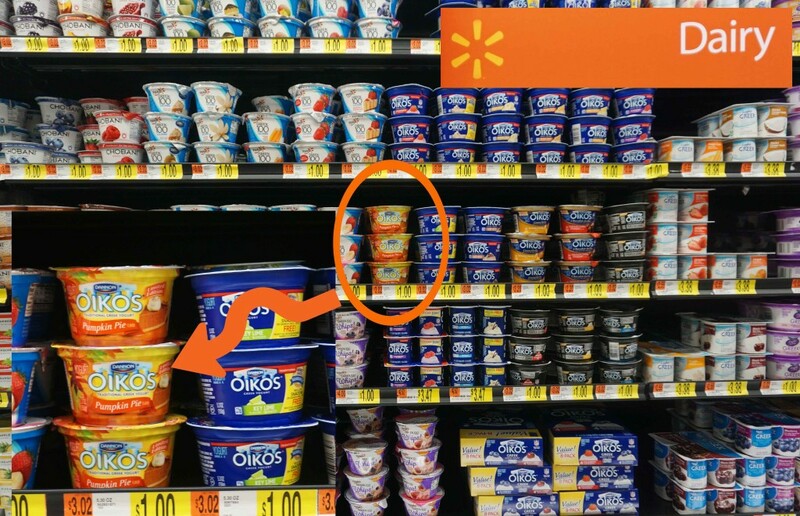 Sadly we cannot get that flavour of Oikos in Canada 🙁 One day maybe!! These not only look cute but delicious too, no wonder kids will love it. What great Cheesecakes, they look awesome! Thanks so much for sharing with Full Plate Thursday and have a wonderful day. You have me at sprinkles! These pumpkin yogurt mini cheesecakes look so inviting. It’s pumpkins everywhere! I am so jealous we don’t get pumpkins here where I live. If we did, these cheesecakes are def the first thing I’d make. These are so stinkin cute for fall! So much fun! How cute!! I’d love to make these during a dinner I’m giving. Thank you. Thanks Marisa, I hope you give them a try and you and your guests enjoy! Thanks Sarah, these are definitely great for kids! Cute! Tiny, easy, healthy and kid friendly – what’s not to love about this recipe? Thanks Alayna! I love the HomeMattersParty and will be sure to stop by! I have been seeing SO much pumpkin lately and I want to make it all! My family will love this! Thanks Brandy, hope you give it a try and you and your family enjoy! Aww, what a fun way to enjoy an afterschool treat. You’re making great memories with your kids. 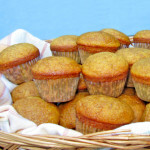 These are so fun and look delicious too, it sounds like you had a completely lovely day making fall memories together! Thanks so much Nicole, we had so much fun making these delicious little cheesecakes! I just made just about the same exact dessert BUT yours is much prettier than mine. So cute and so easy! Thanks Christine, they are indeed so easy to make and fun too! These sound delicious and so easy. 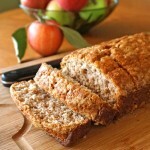 Thanks for the recipe….pinned! I hope the UK supermarkets start carrying pumpkin products soon! Oh my gosh, I want to run right into my kitchen and make these immediately. Never seen a cuter pumpkin treat, you dressed it up so well. Looks like a fun shopping trip too. Thank so much, we had so much fun making these little cheesecakes! What a wonderful idea – healthy and fun at the same time! image-in-ing recently posted…Shake those tail feathers! Thanks so much, these were a lot of fun to make! stevebethere recently posted…WW On A Tuesday – Who’s It For? I am so ready for pumpkin recipes! I want to host a party just to make these delicious sweet treats – love it! So fall-perfect! Thanks Abby, making these little cheesecakes is the perfect excuse to have a party! Thanks Heather, this is indeed a wonderful afternoon snack! Thanks Katie, we did have so much fun making these, the kids and grown-ups alike!